From the mid 1980s to the late 1990s, point-and-click adventure games, or just adventure games in most vernaculars, were mainstays on Macs and PCs. 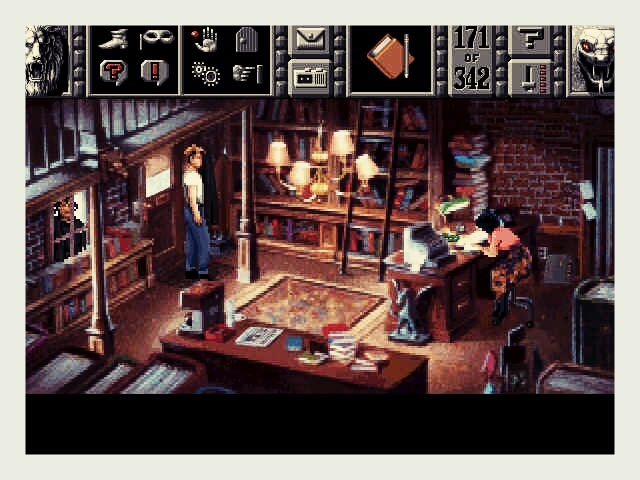 Publishers like Sierra On-Line and LucasArts made their bones on artistically sophisticated, often voice-acted games that used a task bar UI to investigate and interact with a fantasy world. Gabriel Knight: Sins of the Father running in DOSBox. Note the busy point-and-click interface at top. Examples included Gabriel Knight, Space Quest, and Leisure Suit Larry, all from Sierra, and Sam and Max Hit the Road and Full Throttle from LucasArts. After peaking with the blockbuster King Quest’s V: Absence Makes the Heart Go Yonder (which sold a then-astonishing 500,000 copies), the genre entered a gentle decline perhaps attributable to its slower pace and low action quotient. Sierra’s main development office closed in 1999. 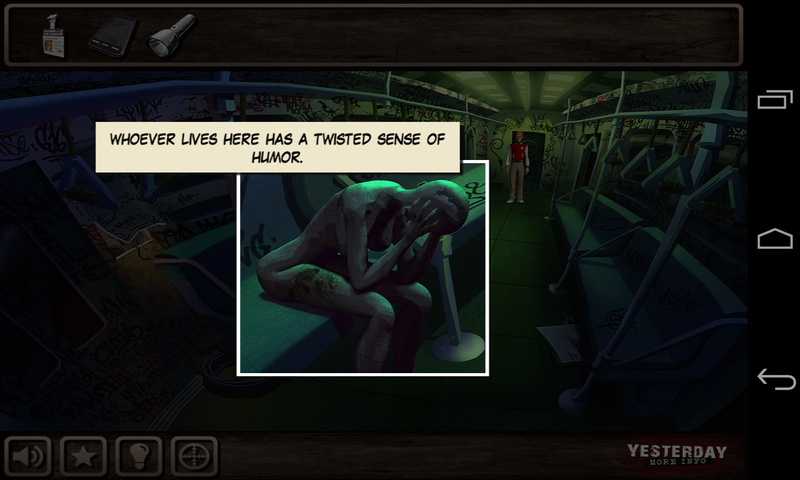 Since reaching that nadir, adventure games have made a befittingly (for the genre) low-key and incremental comeback. Kickstarter has helped. French developer Quantic Dream unleashed progressively bigger hits like Farenheit (Indigo Prophecy) and Heavy Rain, while the Nintendo (3)DS became a sanctuary for visual novels like Cing’s Hotel Dusk and its scarce, brilliant sequel, Last Window. More specifically, the (3)DS’s stylus made the old school UI logic of point-and-click feasible on a mobile device, albeit a dedicated gaming machine. So how have they fared on consumer smartphones and tablets (some of them with their own styli, of course)? Increasingly well, it appears. I’ll focus on three Android games that have elevated and updated the genre: Yesterday by BulkyPix, Broken Sword: The Smoking Mirror (BSII from hereon; its predecessor is subtitled Shadows of the Templars) by Revolution Software, and The Silent Age by House on Fire. Yesterday is a mobile-first game of atypically high quality, while BSII is a remastered version of a 1997 game originally released for Windows (on 2 CD-ROMs: a sign of the times, during an era of growing ambition on the cusp of mainstream DVD usage. The second Gabriel Knight installment came on 6 CDs) and the original PlayStation. 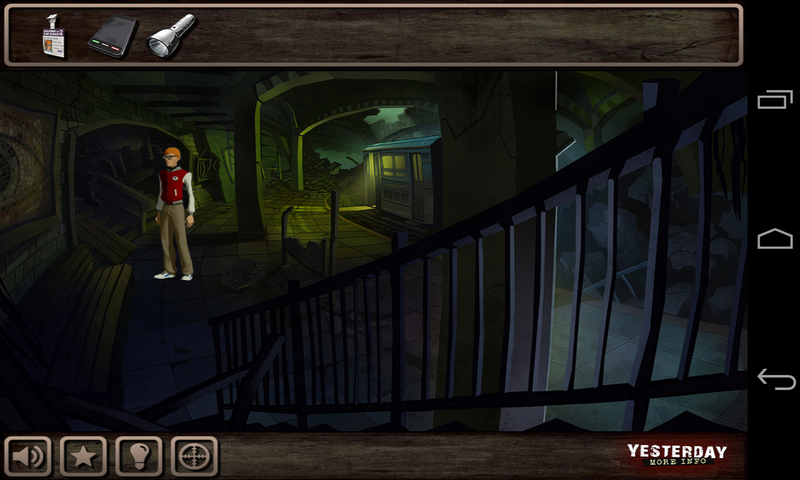 The Silent Age is new episodic adventure game. Despite the differences in their origins, they all achieve a unique high point on Android (they’re available on iOS, too) perhaps do the larger screen real estate, sharp displays, and the availability of a dedicated stylus for the popular Galaxy Note series, too. BSII successfully migrates its classic desktop UI onto mobile. With your Galaxy S4 or Nexus 4 in landscape mode, you have easy access to your frequently-used inventory and journal in the lower corners, and you can get to settings or (gasp!) hints in the less-easily used upper corners. It works because it was simple and intuitive in the first place and didn’t need any heavy modification. 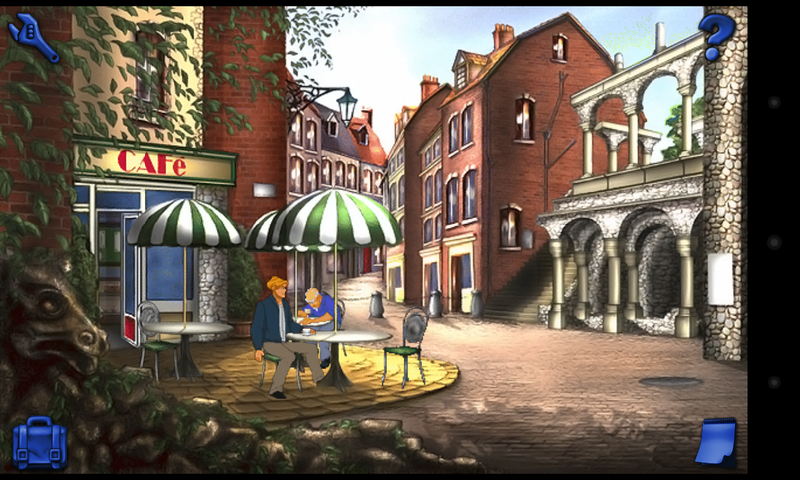 Broken Sword II: The Smoking Mirror running in landscape on a Nexus 4. 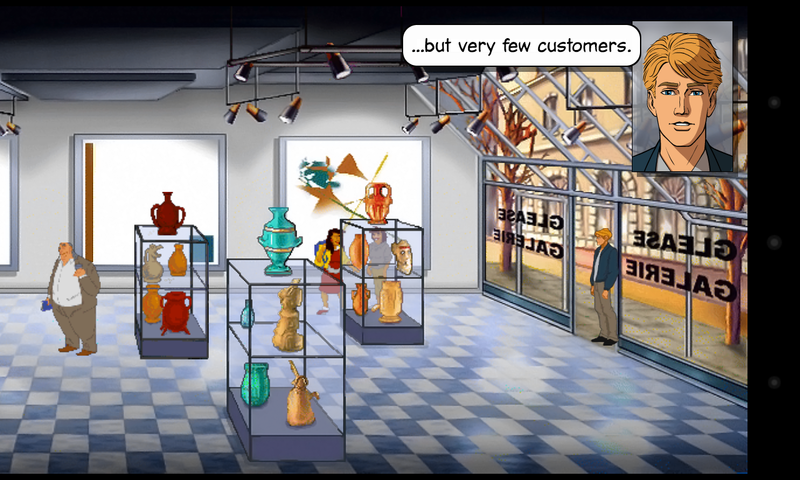 Broken Sword II museum scene, with comic-inspired character chat box. The widescreen aspect is perfect: the game has never looked better, with real pop in its comic book art and characters portraits. In terms of story, you control American tourist George Stobbart as he investigates a mystery related to Mayan archaeology (however, the term “smoking mirror” is a reference to the Aztec god, Tezcatlipoca). Unlike the other installments in the Broken Sword series, BSII is mercifully free of Knights Templar story lines, which are almost required at the door in the realm of dark, self-serious games (Deus Ex and Assassin’s Creed 3 are but two of many possible examples here). Yesterday is an original mobile game. It shares with BSII an affinity for comics: its cut-scenes have comic frames and labels. Despite its novelty, its interface is old school, with an item tray at the top and interface options at the bottom. A comic-inspired scene from Yesterday by BulkyPix. The distinctive point/tap and click UI of Yesterday by BulkyPix. Its learning curve is steeper than BSII, likely because of its more complicated UI. But its animations are smooth, and you can see its latter-day innovations in terms of the different options and sub-menus it offers for interacting with small objects and touch-points, which can sometimes be a problem with the vintage BSII. 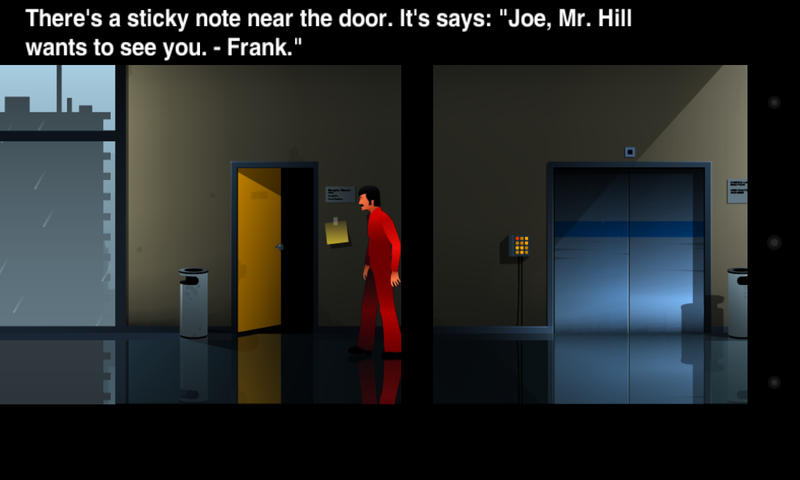 The Silent Age is an adventure game set predominantly in the 1970s. It has a minimalist interface that has no sign of the legacy point and click UIs of Yesterday and especially BSII. Its muted graphics are a great fit for its straightforward (though hardly unchallenging) gameplay, and to top it all off, it’s free (although the developer allows for donations, too). The Silent Age, with its minimalistic UI and understated graphics. Yesterday has been featured on Google Play and BSII is an Editor’s Choice there. Both are worth your time for a few dollars. The Silent Age is worth a try, too.